The buffering wall should stabilise soils and keep them moist, it should slow the drying and scouring effects of the wind, and help restore the micro-climate, allowing food crops to grow around the trees. The UN Convention to Combat Desertification says the goal is to restore 100 million hectares of degraded land by 2030, and mop 250 million tons of carbon from the atmosphere, while creating at least 350 000 rural jobs. But what will the direct impact of this wall of green be on the rainfall patterns of the monsoon in West Africa? And is there some way of knowing where best to position the trees, for the wall to be most effective? These questions were central to a new piece of research by Côte d’Ivoire meteorologist and climate scientist Dr Bamba Adama, at the Université Félix Houphouët Boigny in Abidjan, who recently completed the first modelling analysis of its kind for the region. His findings could help policymakers be more strategic in how they roll out the tree planting efforts on the western-most starting point of the anticipated 8000 km-long buffer. 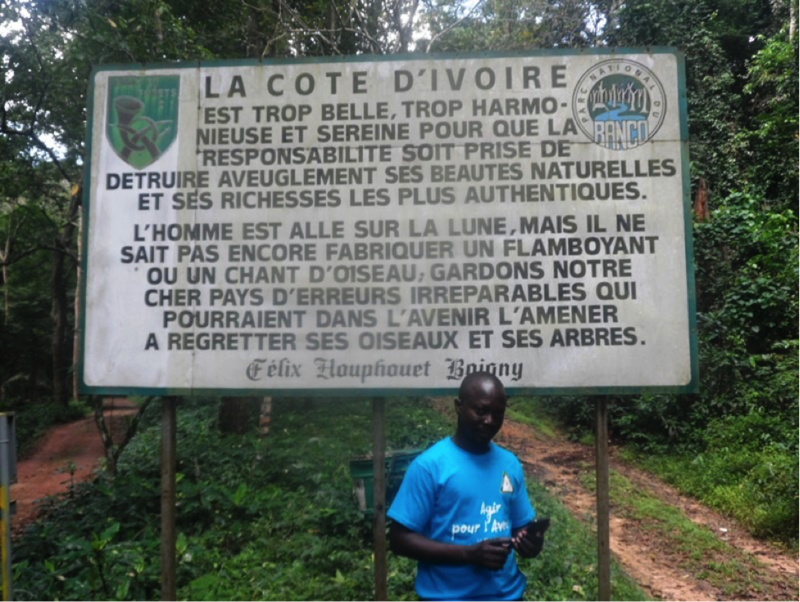 According to Adama, most of the current deforestation that threatens countries like Guinea and Côte d’Ivoire is happening at between 4 to 8 degrees latitude. For the purposes of his modelling, he wanted to see where the most effective placement of a buffering green wall should be on this part of the continent, and see if the modelling could show a possible impact this might have on rainfall and temperature. Uncertainty and variability in the annual monsoon are linked with droughts, famine, and extreme flooding in West Africa, and there seems to have been an increase in extreme drought and rain events in the 1970s and 1980s, according to Adama and his research team with the Future Climate for Africa (FCFA) project. FCFA is an international collaboration of climate scientists who are working towards understanding climate variability and change across sub-Saharan Africa. Adama is part of the West Africa team, looking specifically at how climate change might impact on monsoon conditions here. The model’s findings are clear: if the wall of trees starts at the 10 degree line of latitude, just north of the Guinean capital of Conakry, it might have little impact on the monsoon. But move the trees to the 15 degree line of latitude, which runs just north of Dakar in Senegal, and it could have a significant impact on monsoon conditions. The cooling brought on by the trees is also likely to be significant, dropping average temperatures by as much as 1°C to 2°C over reforested areas and their surrounds. Reforesting will introduce more moisture into the air above the forests, owing to evapotranspiration from the trees’ canopy. This will allow for increased condensation and cloud formation as warm air from the Gulf of Guinea encounters this cooler, moisture-laden air above the forests. Greater cloud formation allows for more rain in a system like this, according to Adama. African Monsoon Multidisciplinary Analysis (AMMA) 2050 aims to address the challenges of understanding how the monsoon will change in future decades, to 2050, and how this information can be most effectively used to support climate-compatible development in the region.